GEHRIMED and MatrixCare partner to provide real-time data exchange between the the medical practitioner’s EHR (GEHRIMED) and the facility’s EHR (MatrixCare). The partnership’s level of integration will provide a higher-quality, and safer level of care for patients nationwide. ASHEVILLE, N.C. (PRWEB) DECEMBER 13, 2017 — GEHRIMED, the creator of the first Stage-2-Certified practice management system designed exclusively for Long-Term/Post-Acute Care (LTPAC) practitioners, and MatrixCare®, the largest LTPAC EHR technology provider in the United States, today announced a strategic relationship to provide meaningful integration to service the thousands of practitioners and medical directors who serve the LTPAC community. The partnership’s level of integration will allow the exchange of data between more than 10,000 senior care facilities, 40,000 long-term care practitioners, and provide a higher-quality, and safer level of care for patients nationwide. Providers have long cited lack of interoperability as a barrier to optimal use of an EHR and timely access to data they need to provide quality care. 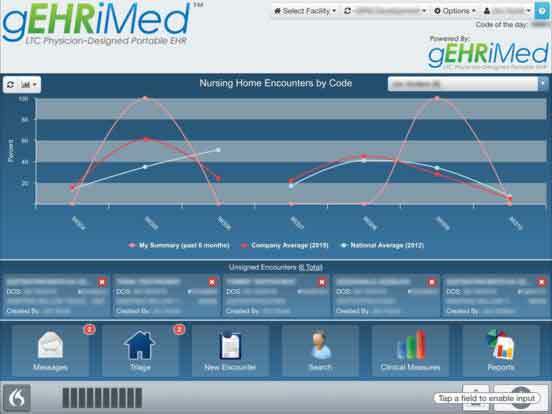 GEHRIMED and MatrixCare have partnered to help care teams across the continuum connect seamlessly. Facilities will now have instant access to shared data to help meet their quality of care goals and coordinated collaborative care plans. Additionally, practitioners will be able to view patient charts and capture patient encounters, all while operating on an Office of the National Coordinator for Health Information Technology (ONC)-Certified platform. Ranked Best in KLAS for Long-Term Care Software in 2017, MatrixCare solutions have powered the long-term care continuum for over 30 years. MatrixCare is the largest U.S. LTPAC technology provider and the first to offer a true full-spectrum solution. Used in more than 13,000 facility-based care settings and 2,500 home care/home health and hospice organizations, MatrixCare’s solutions help skilled nursing and senior living providers, life plan communities (CCRCs), and home health organizations to prosper as we migrate to a fee-for-value healthcare system. Through its CareCommunity population care management platform, built on Microsoft Azure, MatrixCare offers the industry’s first solution for helping the emerging set of conveners and diversified LTPAC operators deliver superior care and better outcomes across the full spectrum of care. Visit http://www.matrixcare.com and http://www.carecommunity.com for more information.